If you’ve every had to support an RDS/Terminal Services environment then you know the headache that Adobe Reader 10/11/DC Protected mode can be. Adobe Reader Protected mode generally will block you from printing or viewing PDFs that come in e-mails. On your own personal system this isn’t a big deal, you just go into “Preferences” and disable it under the security tab and go on with your day. The problem comes into play when your supporting users who don’t have admin rights on the systems they are using. Then the problem grows exponentially depending on how many users you’re supporting. 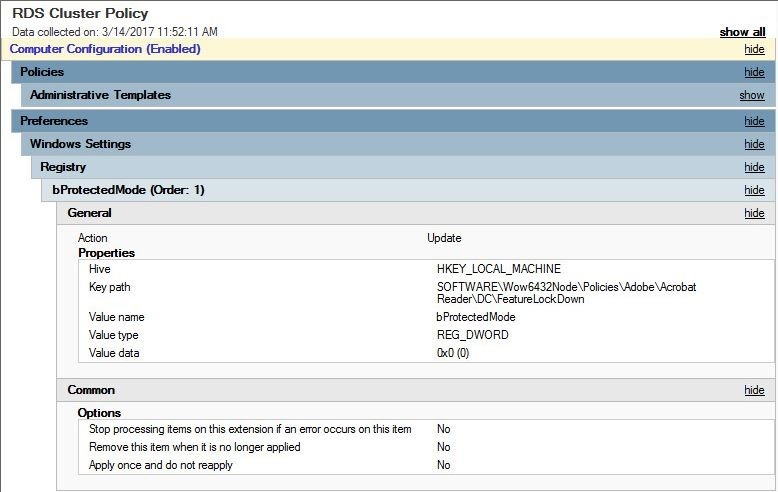 The good news is there is 2 ways to disable protected mode through a GPO/manual registry edit. You can disable it at the user level or the computer level. Depending which one you choose will determine where you create a registry key. When creating/editing the GPO recommend installing Adobe Reader on that machine so you can just browse the registry to get to the proper location. It reduces the chances of typos. 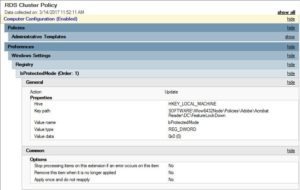 I have confirmed these settings to work on Windows 8/10 and Server 2012/2012 R2. I recommend using the computer option for RDS environments or large groups or computers.